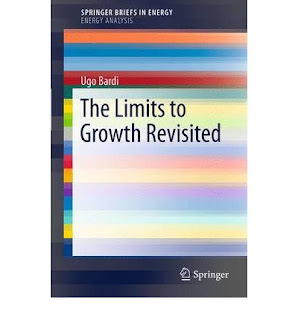 Ugo Bardi at Cassandra's Legacy has a post on his new book on The Limits To Growth - The Limits to Growth Revisited. You can read the book online here at Springer Link. In some respects, "The Limits to Growth Revisited" is a rather technical book. It goes in some depth in describing the controversy that flared between critics (mainly economists) and supporters of the system dynamics methods used for the 1972 study "The Limits to Growth" (LTG). But "LTG revisited" is not just a technical book. It also tells the whole story of the LTG study: how it was conceived, what were the political reactions to it, how it was demonized and misunderstood, and what is its relevance - also in its more recent versions of 1992 and 2004 - to the present situation of the world. Writing this book has been a fascinating work. Re-examining the story of LTG opens up a whole new world that urban legends and propaganda had tried to bury under a layer of lies and misinterpretations. We all have heard of the "mistakes" that the authors of LTG, or their sponsors, the Club of Rome, are said to have made. But LTG was not "wrong": nowhere in the 1972 book you find the mistakes that are commonly attributed to it. LTG never predicted catastrophes to occur soon, never estimated that some specific mineral resources should run out by some specific date, it never contained prophecies of doom. In other words, LTG was not, and never was, "Chicken Little with a computer." What caused the demonization of the study was, in large part, the fact that it was so new and so advanced for its times that it was widely misunderstood, often by its supporters as well as by its detractors. But the misunderstanding was enhanced by a media campaign very similar to the one that has been recently directed against climate science. The trick of these campaigns is always the same: find a single mistake and use it to demonize the whole concept. It doesn't matter that the mistake is real or an invention, it doesn't count whether it is relevant or not. The trick is to repeat the concept of "mistakes" a large number of times and that is enough to confuse the public and cloud the issue. In recent times, the method has been used to demonize climate science with the alleged mistake found in the "hockey stick" temperature reconstruction of past climate. For LTG, the "mistake" was found in a few numbers taken from just one of the many tables of the 1972 book. There was nothing wrong in these numbers, but the concept of the "mistakes of the Club of Rome" went viral and it is still widespread, and perhaps prevalent, whenever the LTG study is mentioned today. Understanding the real message that LTG sent to us in 1972, and that it is still sending, takes a certain effort. First, you have to free your mind from the layers of legends that have accumulated around it over four decades, but that is not enough. You have to free yourself also from the common attitude that prevents us from understanding how complex systems behave. There is no fixed future for systems such as the world's economic system, only trends. But these systems still obey physical laws: the limits of natural resources, the finiteness of the world system, the concentration of greenhouse gases in the atmosphere. And there are the constants of human behavior: mainly our tendency of preferring immediate satisfaction to a future one, a phenomenon known as "discounting the future." All together, these factors push the world system to follow a well defined path. We cannot determine exactly what the future will be, but we can produce a "fan" of trajectories that show to us how where the system is heading to. The original 1972 LTG study had already identified the main factors that have been dominating the behavior of the world's economy. The combined effects of resource depletion and pollution accumulation (seen today mainly in terms of climate change) have been gradually reducing the ability of the industrial system of accumulating capital and of fuelling growth. These factors will, eventually, cause the world's industrial and agricultural systems to start a decline that could be defined as "collapse" which, later on, involves also the world's population. It is not possible to determine exact dates for these events but, still, the insight that this kind of modelling offers to us is amazing. Just think how, already 40 years ago, the LTG study may have anticipated the worldwide financial crisis that occurred in 2008 and also the present debate on whether climate change or "peak resources" is the most important problem that we face. Dynamic modelling is a flexible tool, something that enhances the capability of the human mind to understand the world that surrounds us. The 1972 LTG study was the first to use this tool, but it is not the only possible way. Simpler dynamic models will tend to produce the same final outcome. If we use this tool, and we use it wisely, we can discover that nothing of the future is written in stone. The future is something that we create every day with our actions. At the same time, we can also discover that the future has a life of its own, that it resents being forced into what we think it should be on the basis of obsolete ideologies. We will have to adapt to the future and that may not be painless but, if we try to understand the future, we may discover that it doesn't need to be our enemy.